West," is the ruler of the western paradise and goddess of immortality. She is charged with overseeing the wall of heaven. 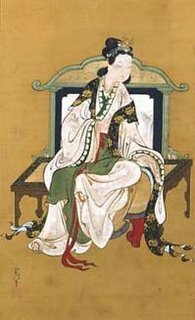 Originally, from the earliest known depictions of her in the "Guideways of Mountains and Seas" during the Zhou Dynasty, she was a ferocious goddess with the teeth of a tiger, who sent plagues down upon the world. After she was adopted into the Taoist pantheon, she was transformed into a benign deity. In popular Chinese mythology, Xi Wangmu lived in a palace made entirely of jade, so she has often been considered the patron deity of jade carvers. She also possesses a peach tree which, every 3,000 years, produces a peach that grants immortality. probably arose from her origin as the goddess of fertility.